Frontier business of S.T. (Tol) and E.F. (Lish) Dawson, brothers. Lish Dawson, 1891-92 Sheriff of Ector County, had a barber chair in the Saloon, and helped tend bar. Liquor was in 40-gallon barrels. Ice for drinks was hauled from Great Lakes by Texas & Pacific Railroad. 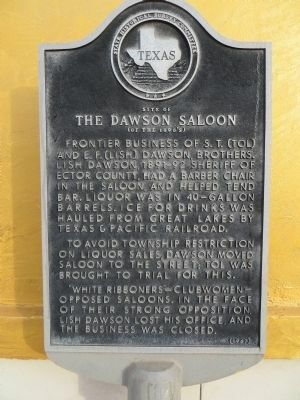 To avoid township restriction on liquor sales, Dawson moved saloon to the street; Tol was brought to trial for this. "White Ribboners"—Clubwomen—opposed saloons. In the face of their strong opposition, Lish Dawson lost his office, and the business was closed. Location. 31° 50.714′ N, 102° 22.103′ W. Marker is in Odessa, Texas, in Ector County. 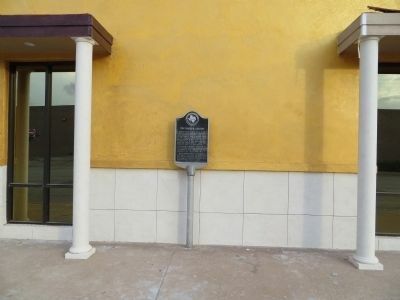 Marker is on West 2nd Street (Business Interstate 20) east of North Lee Avenue, on the right when traveling east. Touch for map. 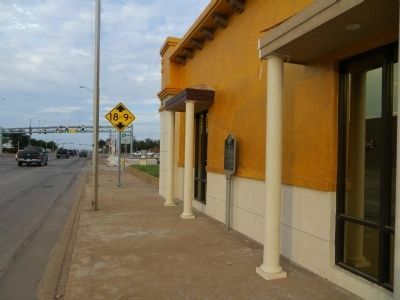 Marker is at or near this postal address: 125 West 2nd Street, Odessa TX 79761, United States of America. Touch for directions. (about 300 feet away); Site of Livery Stable and Wagon Yard (about 300 feet away); Site of The Odessa Sanitarium (about 600 feet away); General Matthew D. Ector (about 700 feet away); Ector County Courthouse (about 700 feet away); Ector County Land Rush (about 700 feet away); The Waddell Pecan Tree (about 700 feet away). Touch for a list and map of all markers in Odessa. More. Search the internet for Site of The Dawson Saloon. Credits. This page was last revised on June 16, 2016. This page originally submitted on July 21, 2015, by Bill Kirchner of Tucson, Arizona. This page has been viewed 246 times since then and 9 times this year. Photos: 1, 2, 3. submitted on July 21, 2015, by Bill Kirchner of Tucson, Arizona. • Bernard Fisher was the editor who published this page.